The Ribbon Menu can be displayed or hidden at any time by pressing the MENU button on the hand controller. The Ribbon Menu displays at the top of the map screen - press twice to view when navigating from other screens. The menu item last accessed will be highlighted. LEFT or RIGHT controller buttons are used to highlight the desired menu option - the sub menu list will display automatically. Parameter changes are immediately included in the moving map and/or ClearNav calculations as appropriate. 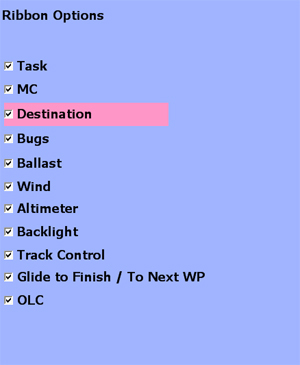 The RIBBON MENU - TASK icon gives the pilot one location to control all task functions. Four screens are available via tab selection: Edit, Action, Task Map and Task LIst. EDIT - Supports changes to any attribute of the Active Task. his screen is used to create or modify tasks. ACTION - Allows the pilot to control Task Start, Active Leg, Turn Initiation, Final Glide Start, and Speed to use in time calculations. TASK MAP - Displays a real-time view of all task legs and suggested turn area penetration depths calculated using a dynamic model and achieved or entered speeds. The following link presents a view of all task functions in more detail. "TO FINISH" or the name of the next Turnpoint/Waypoint will be displayed in the destination window. 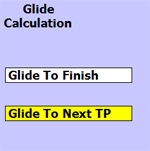 Glide to Finish will display a checkered flag in the ribbon menu - Glide to a Turnpoint will display the red pennant. The system will display the distance and altitude difference for the glide target as appropriate. If you have not reached the current target task turnpoint, the system ask for a confirmation when Glide to Next Turnpoint is selected. ClearNav navigates to the closest point on the bottom circumference of the Finish Cylinder. After crossing the circumference, ClearNav switches to the center of the Finish Cylinder at ground level as the navigation point. The altitude margin (Arrival Height AGL) vakue set in the Final Glide settings is added to the Finish Cylinder MSL altitude for calculating final glide margin. The MC setting immediatly impacts all system calculations and associated graphical displays. 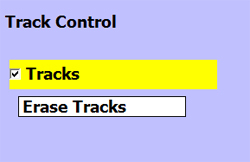 The size of the thermal tracks, plotted as circles in the flight track on the main map page, immediately change as the MC is changed. 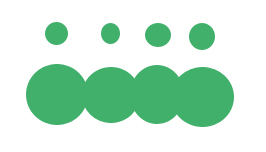 Green areas reflect measured lift rates that meet or exceed the entered MC value. These can be uses as a tool to understand and identify thermal and other lift patterns. 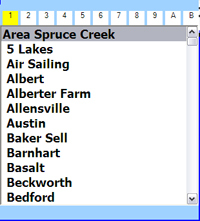 Displays TP List in Alphabetic order - use controller LEFT and RIGHT buttons to select desired list. If a task is in progress, navigation to the current task turnpoint is suspended - but can be restarted by selecting 'Resume' on the moving map or 'Resume Task' on the Action screen. All task metrics from the start are retained. Select hand controller FOCUS or MENU buttons to exit list with no TP selection . Controller Left/Right buttons select letter to use as a 'filter'. The list cursor will highlight the first occurrence of a TP matching the 'filter' value. ClearNav uses your selected wind type in all calculations. 'Auto Wind' uses ClearNav's last calculated Winds ... or current winds from a CAI 302 or other supported device. Last calculated ClearNav winds may be from much earlier in the flight ... or could be zero (000/0) if the flight just started. You have to circle in a thermal to allow ClearNav to generate a new calculation based on GPS measured wind drift. 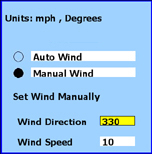 'Manual Wind' requires input of Wind Direction and Speed - Unit types (ex. mph, degrees) are displayed on the top of the Auto/Manual selection screen. The Auto or Manual wind speed and direction information is displayed in a gray cell in the lower left corner of the Moving Map. If the Manual Wind option is selected, the Auto Wind speed and direction is displayed directly above to advise that ClearNav is using Manual Wind - and to show you the current Auto Wind value. If you only see the gray box, you are using Auto winds. The wind display can also include a numeric compass bearing - by selecting this feature in the Preferences/On-Screen Options menu. Select ClearNav Wind Source. This is immediately used in all calculations. Enter Wind Speed and Direction for Manual Wind. When two sets of wind information are displayed in the lower left corner of the map - this means Manual Wind has been selected. The Manually Wind value/vector is displayed in the gray box. The Auto Wind value/vector is displayed immediately above. The display below shows the same information - however, 'Numeric Wind Direction' has been selected in the Preferences Menu and the wind compass direction is also displayed. ClearNav will default to the GPS field elevation at the start of each flight when it obtains a position fix. Manually entered values will not be overridden. The mBar and In. Hg values are calculated and displayed as the Altimeter Setting is changed. Power Save - Screen automatically sets to low intensity after 25 seconds - resets to high intensity with any controller button press. Low, Medium, High - adjust screen intensity to accommodate ambient light conditions. Off - turns display off to reduce current drain to a minimum. The system automatically switches to PowerSave mode with any controller button push. Scroll to Power Save, Low, Medium, High or Off option ... and Select. When invoked from the ribbon menu, the OLC function performs a real-time evaluation of your current flight to calculate metrics and scores. i.e. it does not constatntly calculate these metrics in the background. The Check Box for 'OLC On' is important, because the OLC function has to track a few specific benchmarks throughout the flight to correctly calculate metrics. If you have the box unchecked before the flight - or if you uncheck during the flight - the OLC metrics may not be totally correct. When invoked from the ribbon menu, a "Loading, Please Wait" message will display. The "Finish Point" is for setting the goal, if it is not your takeoff point, which is the default. The app displays the achieved OLC distance and achieved FAI triangle. 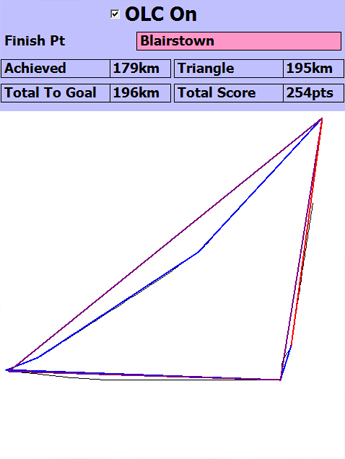 The FAI Triangle distance displayed assumes the finish will be completed at the Finish Point. Also displayed is the total distance assuming return to the finish point - along with total score (OLC Plus, unhandicapped) - also assuming returning to the finish point. The app assumes the triangle will be closed within 1 km horizontally and vertically per the OLC rules. Pilots can toggle Thermalling Tracks on or off ... or erase all tracks created to that point in time. Erased tracks cannot be recovered. ClearNav Thermal Tracks are based on real-time climb metrics and provide effective graphical guidance to the strongest lift areas. The MacCready setting allows the pilot to display thermal 'tracks' that meet or exceed the entered MC value. A high MC will typically produce small plotting circles that identify the highest lift rates found in thermal cores. Lower MC values will typically broaden the plotting circles to match the larger areas of lower lift found around the core. This checkbox menu allows you to control which items are displayed on the ribbon menu.